Silver finish with gold finish barbed wire trim. 1-1/2" x 7/8"
Shiny silver and gold finish. 1-3/8"x 1"
Hand polished, antique silver finish. 7/8" x 7/8"
1-1/2" Shiny silver finish over solid brass. Engraved, silver plated 7/8" x 7/8". Right facing eagle. Nickel plated with antique highlights. 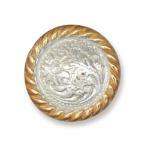 Dillon Flower Concho 1" Hand polished antique Silver finish. 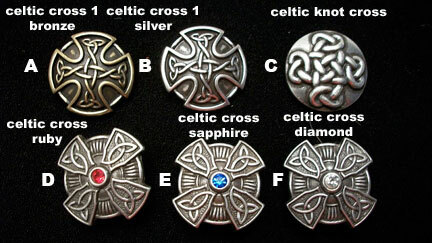 spotted Celtic triskel 1" antique silver. Conchos with color! These fancier conchos can add some nice color to your collar. Silver with yellow gold and rose gold finish details on a black background accented with faux rubies. 1-3/8" x 1-1/16". Silver with yellow gold and rose gold finish details on a black background accented with faux rubies. Beautiful faux topaz stone is surrounded by a gold plate flower and rope edge with silver plate floral pattern and enameled black background. 3/4", 1", 1 1/4". Beautiful faux topaz stone is surrounded by a gold plate flower and rope edge with silver plate floral pattern and enameled black background. 1-3/8" x 1-1/16". Polished antique silver plate and hand painted enamel flower and leaves accented with faux stones. 1-3/4"x 7/8"
Polished antique silver plate with rope edge and hand painted enamel flower and leaves accented with a faux pink stone. 1"
Polished antique silver plate and hand painted enamel flower and leaves accented with faux stones. 1"
Polished antique silver plate with hand painted enamel flower and leaves 1". Polished antique silver plate and hand painted enamel flower and leaves accented with faux stones. These conchos are larger. Some of them are too large for a smaller collar. Presenting the new Bad Boy Bunch! These conchos the answer for smaller collars for the iggies and whippets. The first one shown is listed above as AE Austin Spot concho for size comparison. Something new! 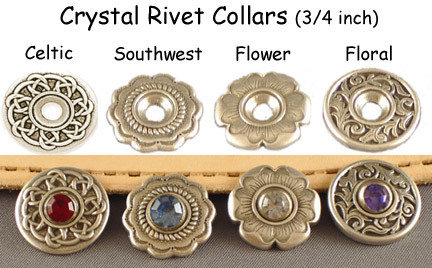 Crystal rivet collar conchos. 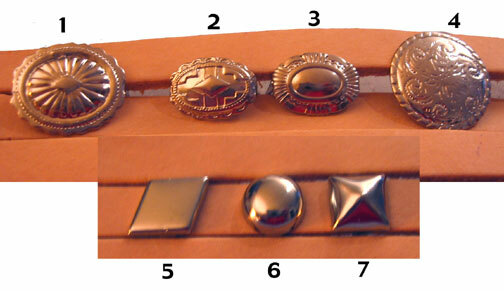 You pick which of the four designs and what color crystal rivet (below) to create your own custom concho. 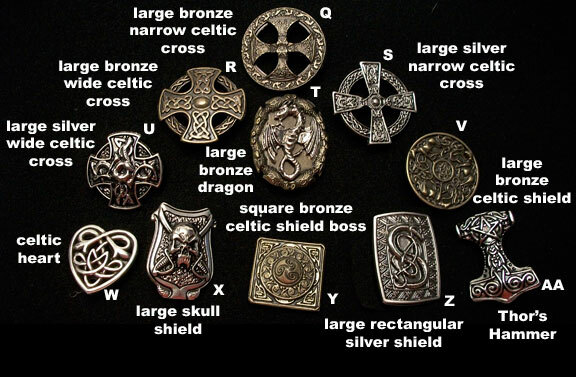 These are smaller than many of the conchos listed above and can work better on some of the smaller collars.